I have had this pattern for quite a while and decided it was about time I used it. As usual, I googled the pattern to see what others had made. Unfortunately there was not a lot of enthusiasm for the pattern out there. It seemed everyone who had made it needed major adjustments to even begin to achieve a good fit. The latter is the more accurate picture. Why I looked at this picture and still decided to use the pattern is beyond me. The fit is horrendous and that badly pressed pink fabric with the wonky stripes is hurting my eyes! To cut a long story short, I should have listened to those wise sewers who had gone before me. However, I am not one to abandon a project so, once I'd started, I fussed with this until it was wearable. I'm very happy with the dress now, but I wouldn't recommend the pattern unless you are after an unwearable sack a loose beach cover-up. Having established that the pattern was a dud, let's talk about the fabric. This is unlike any fabric I've seen before. It is cotton with random flower patterns slashed into it. The flowers seem to have a dot in the centre indicating that perhaps a special tool was used to make the cuts. I bought it at the 'Breathless' designer fabric sale in Perth a couple of months ago. I don't know if the cuts were made by the designer or if she bought it like that. I would love to find out. 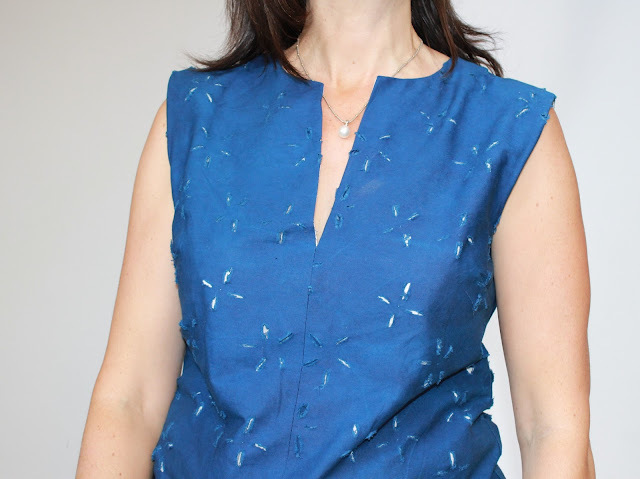 The fabric was originally white and I dyed it blue with the Dharma Trading Indigo kit. I dipped the fabric three times, for about five minutes each time, to get this intensity of colour. To highlight the flowers, the dress was completely lined with white cotton. The pattern has a centre seam, which was useful to drastically reduce the length of the neckline opening. I omitted the facings since I had lined the dress. 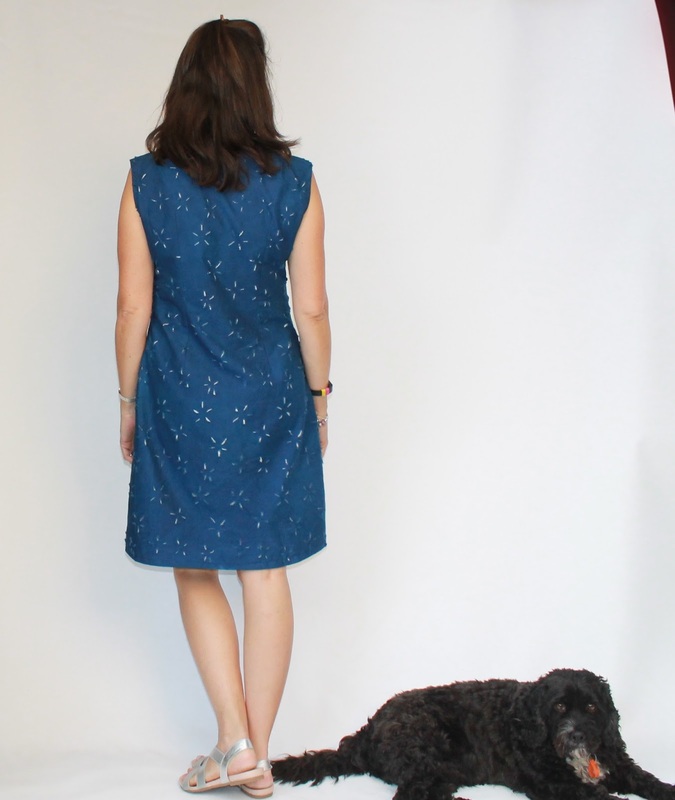 To improve the fit I added back darts using the Colette Laurel shift dress pattern as a guide for length and placement of the darts. I also took in the side seams a fair bit and omitted the pockets, which would have added bulk in the wrong places. The fit adjustments were numerous, but fortunately not difficult due to the simplicity of the pattern. 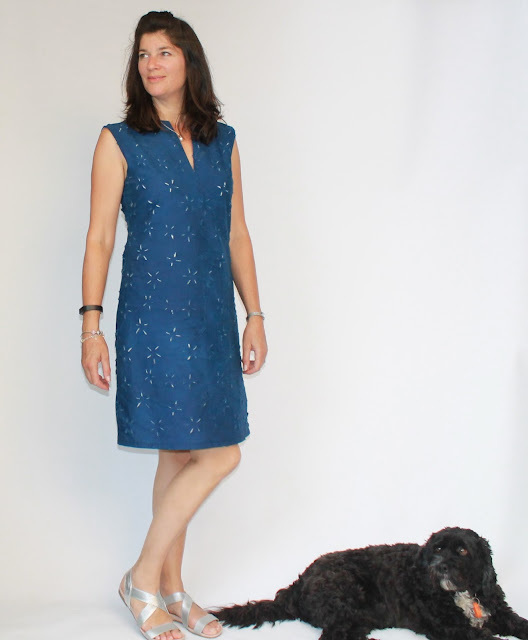 I love how the dress turned out, but that is mostly down to the interesting fabric and the indigo dyeing. I hope I've learned my lesson not to ignore the findings of my pattern research in future! I am loving your indigo dyeing adventures, and this fabric is brilliant in every sense of the word. Your dress is now really elegant, with a perfect fit so it was worth fiddling with it. This will be an easy dress to wear through our warm summer months! Thanks Sue. I am inspired to experiment with making fabric like this. It's pretty cool. I love that fabric and your fit adjustments have made a very wearable dress. Lovely! Thank you. I am much more inclined to persevere with a failing project these days and it's definitely worth doing. It is funny how Vogue patterns work on different body shapes because I made this and other than adding darts in the back like you and shortening the front opening like you, it fitted me perfectly. I almost thought that Vogue patterns were good for me again. I love the colour you have achieved with dying this fabric and I really like the dress on you. That's really interesting. Vogue usually fits me well. I guess this was designed to be loose, but looks much better fitted. Thank gawd we can sew and make our own improvements! You have certainly worked your magic on this pattern Megan. Your dress looks fabulous. The fit is flattering, the colour is gorgeous and the white lining has made a great feature of that unusual fabric. No wonder you are pleased! Luckily anything suits a good looking woman. Well, you certainly conquered the pattern! your dress is lovely and the fabric is so very interesting. Nice work! You took a pattern that didn't work and turned out a beautiful dress. Love how you worked the fabric too. Wow! 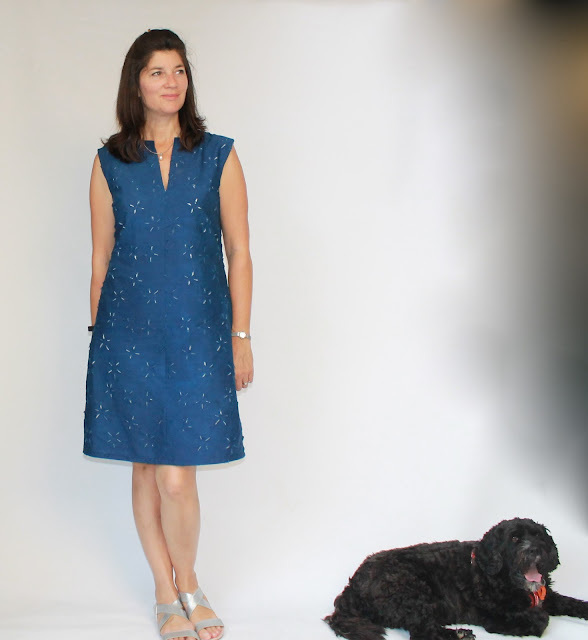 I bought this pattern when I was heavier thinking the looseness would help conceal my body. I looked at it again this summer and thought about making it then. I still like the styling but will triple think before using it now. 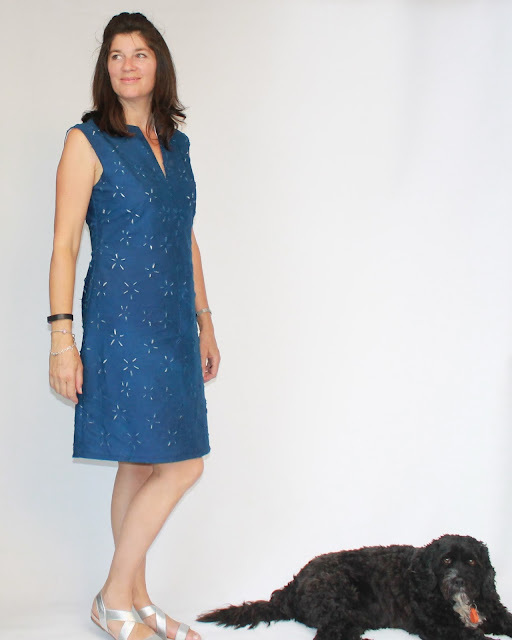 Wonderful pattern review and AMAZING finished dress! This is lovely on you!!! wow, I Iove everything about this, the fabric, the color, the simple shape. I wonder if I could create that effect on a fabric with the flower details. perfect choice of pattern shape despite the issues. Ditto Coco's comment - you conquered the pattern! It looks beautiful on you, and the color you died it is wonderful. You're a great artiste! 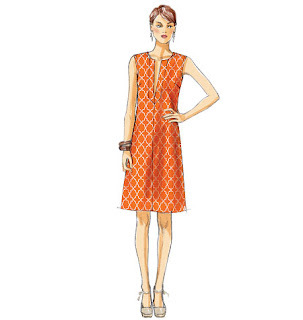 Well, your beautifully fitted dress looks pretty much like the pattern drawing. You are clearly better at sewing and fitting (and pressing) than the Vogue people. The fabric is outstanding, what a great idea to dye it and underline in white to emphasize the cut outs. Gorgeous. Are you and Caroline playing in the same dye pot over in the West? Seriously wondrous results!